Many years production experience results in a compact. 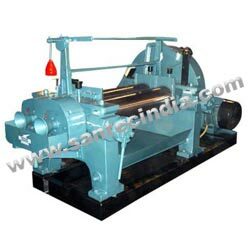 Streamlined machine body which Facilities Installation and sale maintenance work. Builtin driving units less, space requirement 6- pole Electric motor using circular type reducer gives lowest noise level. Rolls are hard-chromium plated ground and polished, surface hardness 60 HRC or above (hardness depth approx 1.5 mm)roughness height of 0.5 µm. Roll bearings are in the from of double  row Taper Sell-Aligning Roller bearings. Roll precision allows sheeting thickness to 0.12 mm (thinner on request ). The bearings are lubricated with a auto-lubricating system. Specially produced Roll Mill prevents the two rolls from touching each other during operation. An emergency safety device by a knee pedal to facilitate automatic stopping the machine and to enable the rolls to be reversed about 1/4 of the circumferences. Materials guide plate produced of Teflon, heat and acid-resistant, no staining and will do harm to the rolls as comparing with convectional bronze guide bras. Maximum working temperature upto 240 Degree Celsius. (electric heating system higher on request). Most precise temperature control thanks to specialized heating systems. For electric heating. Most precise automatic temperature controller and specially designed temperature sensors are used with accurate indication of working temperature to also allow tolerance of ± 2 degree Celsius. Surface temperature deviations are ± 2 degree Celsius.